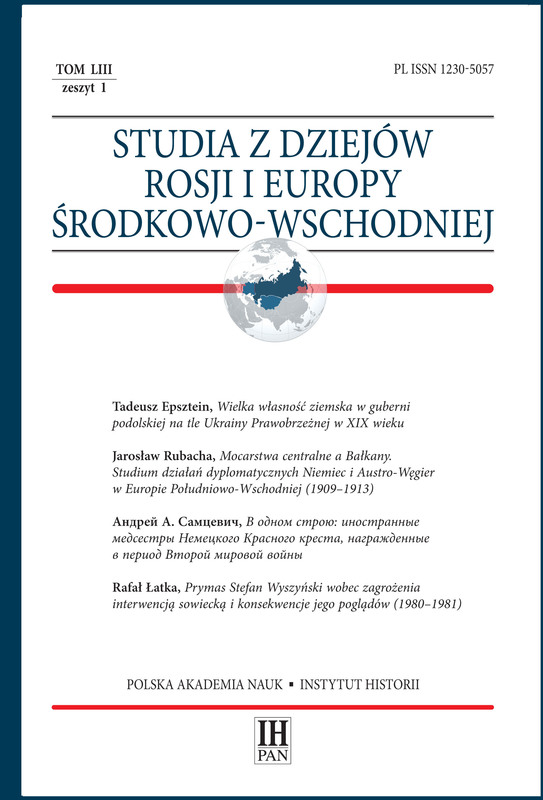 “Studies into the History of Russia and Central-Eastern Europe” is published by the Tadeusz Manteuffel Institute of History of the Polish Academy of Sciences (IH PAN). Over the last 50 years the journal was published once a year. Starting from no. XLVIII it has been published twice a year in a completely new graphic layout. This worldwide scientific journal is devoted to widely understood history of East and Central Europe, the USSR and Russia in the 19th and 20th century. We also publish articles and research works concerning European region’s connections with remaining countries in the whole world together with dissertations on the history of empires. The journal was established in 1963. Rafał Gerber, the professor of the University of Warsaw and the head of the Department of History of European Socialist Countries IH PAN, was the first editor-in-chief. After many years, this Department was transformed into the Department of History of the 19th and 20th century Europe. However, since 2013 it has been functioning as the Department of History of East Europe and Research on the 19th and 20th century Empires. Prof. Jan Żarnowski, prof. Piotr Łossowski and prof. Marek Kazimierz Kamiński were next consecutive editors. Now prof. Andrzej Nowak’s team edits the journal and the Editorial Board consists of the eminent representatives of world historical science such as Natalia Liebiediewa, Kimitaka Matsuzato, Timothy Snyder, Roman Szporluk, Jarosław Hrycak and Darius Staliunas.The member of the Council was Richard Pipes, who died in 2018. The first issue of the journal was published in 1965 and was titled “The USSR and Central European History Research”. In 1992 the title was changed to “Studies into the History of Russia and Central-Eastern Europe”. “Studies into the History of Russia and Central-Eastern Europe” is in ERIH PLUS (the European Reference Index for the Humanities) and IC JML (the Index Copernicus Journals Master List). The journal is also indexed in CEJSH database (the Central European Journal of Social Sciences and Humanities), CEEOL (the Central and Eastern European Online Library), BazHum (a bibliographic database of journals from humanities and humanistic social studies) nad Google Scholar. The journal is issued on an open access basis under the CC BY-ND license and available on Akademicka Platforma Czasopism.